When deciding what type of flooring to use in your industrial manufacturing facility, you might be considering epoxy floor coatings. This article addresses the reasons Epoxy Flooring is ideal for facilities that manufacture goods. Your facility likely faces a daily attack of wear and tear, heavy equipment, foot traffic, chemicals, oils or other abuses. Epoxy floor coatings not only protect your flooring from wear and tear and damage, they also make your floors look beautiful. 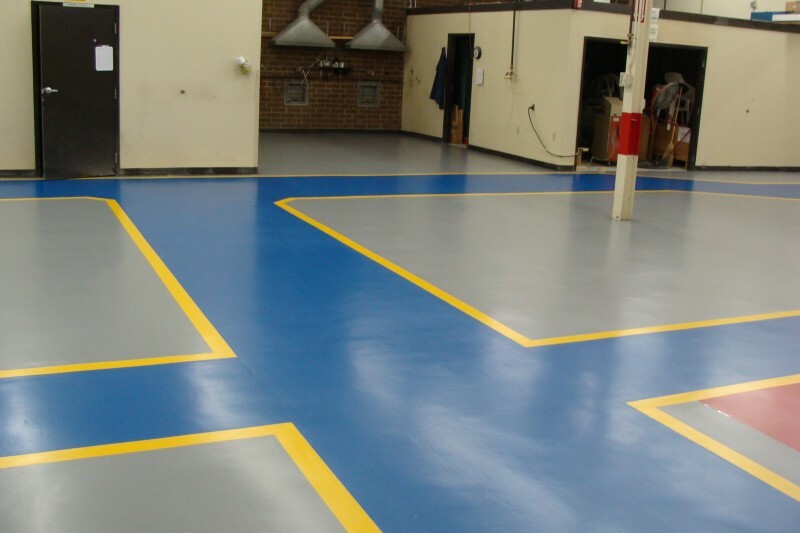 Here are 5 reasons epoxy floor coatings are the best choice for manufacturing facilities. As is true of most manufacturing facilities, constant wear and tear is the rule rather than the exception. Epoxy floor coatings are made to protect your floor from the damage that comes with the day to day operations of a working facility. Heavy duty industrial floor coatings provide a layer of protection between your cement and your equipment, people and chemicals, oils and debris that come in contact with your concrete floors on a daily basis. Whether your manufacturing facility is a business where chemicals are regularly present in the day to day operations or else they are simply part of the life of your facility whether they be from equipment vehicles present. It is critical that your flooring be easy to clean and maintain. Floors without epoxy coatings risk staining and can be difficult to clean. Epoxy floor coatings provide your cement floors an easy to clean and maintain surface which in turn ensures the safety of your facility while preserving it’s beauty. Epoxy floor coatings allow you to design a flooring system that looks amazing, but also serves a purpose. Your floor can be designed in any number of ways whether you need line striping to create specific areas within your facility or you want to indicate some areas as off-limits or more dangerous than others, all of this is possible with epoxy floor coatings. Plus, the look of your new epoxy floor will incite a feeling of pride and care within your facility. This is just one of the many fringe benefits of utilizing epoxy floor systems in your facility. Liquid Floor Inc. has been installing epoxy flooring systems for over 20 years. Call us today for a free estimate!